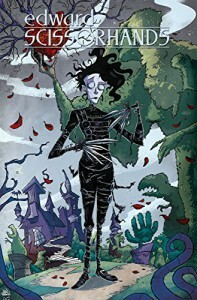 I think that if you liked the movie, you'll like this short first volume of graphic novels with Edward Scissorhands. It had been some time for me since I last saw the movie, but I really should watch it again. This graphic novel really reminded me of the movie. Not just because it obviously has Edward in it, but also the complete feel of the novel was almost the same for me. The artwork resembles (at least for me) that of the American animation series that I used to watch as a kid. So even more nostalgia. A lovely little book, looking forward to more Edward Scissorhands novels!